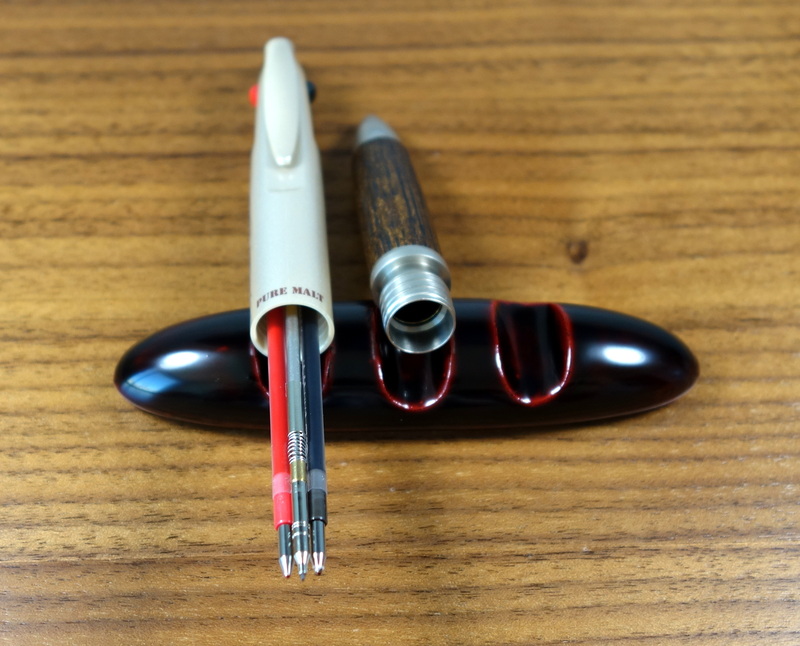 The Uni Pure Malt is a multi-pen with two 0.7mm Uni Jetstream hybrid ballpoints (black + red) and a 0.7mm mechanical pencil. If you are wondering what “Pure Malt” refers to, it’s the wooden grip which supposedly comes from the wood used in Japanese whiskey barrels. The Pure Malt comes in a couple whiskey related colors (browns). I chose one with a champagne colored body and a dark wood grip that I think looks great together. The barrel unfortunately has two seams and they go right down the middle of the plastic part of the body which is poor placement if you ask me. The words “PURE” and “MALT” are split by the seam. The bottom half of the pen appears to be made of metal and gives the pen its nice weight. The Pure Malt weighs 22.6 grams and feels of good quality. It measures just under 6″ long and is about 0.6″ at the widest part of the barrel. The Jetstream refills perform very well and are my favorite ballpoint style refills. The lines are quite clean and dark by comparison to a standard ballpoint. The point glides across with minimal resistance. The mechanical pencil is deployed by pressing the clip down and to advance the lead you just click the clip in the down position. The 0.7mm mechanical pencil works very well. I picked up this pen in Japan for at the retail price of 1,000 Yen which is just under $10 USD and for that price I am really happy with the Pure Malt, in fact it is my favorite multi-pen I have come across in a long time. How do you change the mechanical pencil lead? Feed it directly into the pencil barrel via the tip? I feed it directly via the tip. There is no eraser and thus no cap that comes off where lead can fed through the top.